La Marina Moto Tours is a company specialised in guided tours on bikes. 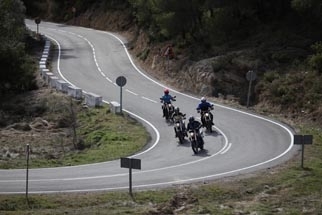 La Marina Moto Tours has knowledgeable guides working, with enough knowledge of the area and experience on the field of bike tours and the guiding of them. Fred, our guide, has lots of years of experience with bikes and knows how to adapt to the speed and experience of the group. During the tour fred will give you the necessary explanation of all the places you will visit. 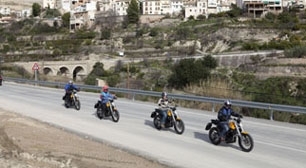 La Marina Moto Tours started in 2010 and ever since we have had customers from over 18 different countries, motorcycle drivers who each admit that they have enjoyed themselves more than they ever dared to dream. No one could imagine that the quality of the roads was this good, and everyone keeps on telling how much they enjoyed the tour - wether they were alone or in a group. There are 3 different routes with the BMW, Ducati and H-D: pleasure assured for different days! We are situated in the village of La Nucia, a strategic location for access to the mountains of the La Marina region, and still close to the cities of Benidorm, Albir and Altea. You will have a bike that fits your personality, when you decide to start one of our tours. Our van will transport you in all comfort from your hotel until where you will start the tour, and the other way around. Our bikes, wether it is the BMW, Ducati or the Harley Davidson, are new, with very low mileage and are always thoroughly inspected before the tour begins so you can start with full confidence. We have a large garage where we do all these checkups before the tour starts, by our own people. With the restaurants we visit on the tour we have made special arrangements so that you may enjoy the best quality when it concerns discovering the Spanish local kitchen. Thanks to the quick service you will not lose any time and you can start the tour directly after your meal. We do everything that is necessary to make this BMW, Ducati or Harley Davidson tour an unforgettable day, a day on which you will have intensely enjoyed the beauty that riding on a motorcycle brings with it. You will arrive with a smile, and we'll take care of the rest. We will make sure you will have a fantastic new experience that you can share with your friends and acquaintances. We want you to think back of us and the tour with lots of pleasure and that you will bring your friends next time.